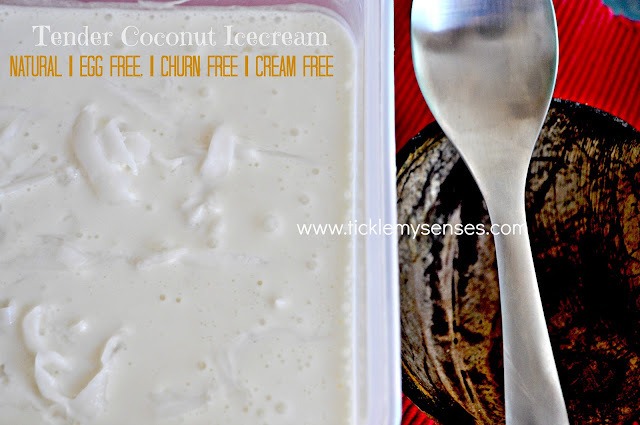 Tickle My Senses: Egg free and No-Churn Tender Coconut Ice cream. I first came across the concept of 'Tender Coconut Ice cream' on my recent trip home. A post dinner drive to the Naturals Icecream parlour a couple of minutes from home is simply not be missed. A few flavours packed into boxes, we would rush home to indulge our senses and our already bursting bellies to some luscious creamy ice creams..hmmm. Of the many delicious flavours on offer at Naturals 'Pistachios, Roasted Almonds, Custard apple/ Sitaphal, Strawberry'...to name a few.... 'Tender Coconut' is a definite favourite. This icecream was on top of the to-do list of the many recipes lined up to celebrate summer. Made with simple cupboard ingredients, it is Fuss free| No-churn | Cream free | and Egg free and definitely the creamiest natural Coconut Ice cream ever despite the absence of cream or egg yolks. For the flavour of Coconut I used coconut milk and a can of condensed milk for the sweet creaminess. I had a couple of chewy coconut biscuits in my pantry cupboard and a pack of frozen tender coconut bits lying in my freezer. 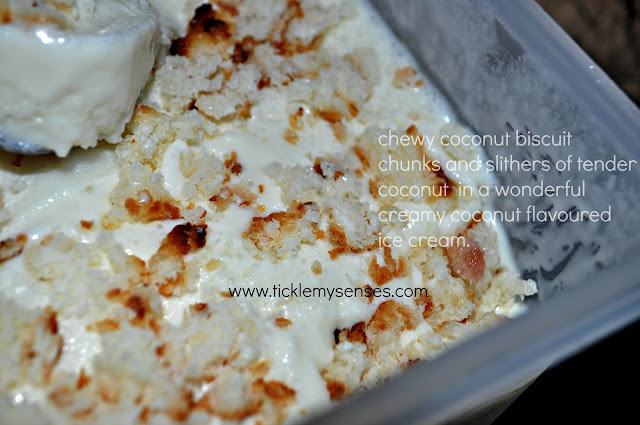 Incorporated both into my icecream for an absoulutely divine Coconutey icecream. 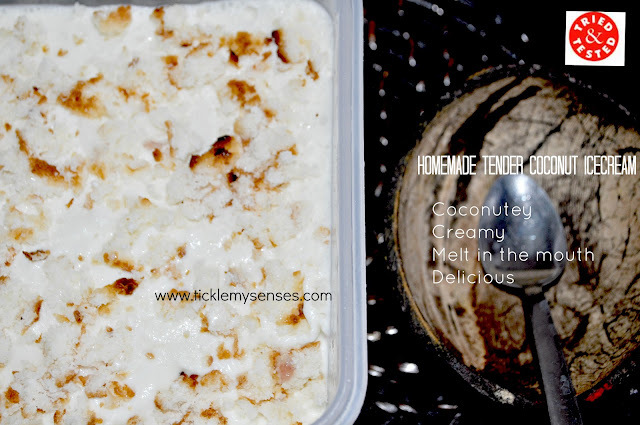 Although the next time I will puree the tender coconut to tinier bits so that I can enjoy the creaminess of the ice cream even more. Do try my version of this icecream and let me know your thoughts on it. You could however perfectly enjoy the flavours of this ice cream minus the coconut biscuit topping. Tender coconut slithers: 3/4 cup. Try to get tender coconut that is neither too tender or too mature, but in between. Coconut biscuits: 2 nos (optional) for topping. 2. Add vanilla extract and rum and beat again for a minute. Pour the ice cream into an airtight container and freeze for 45 minutes to an hour till slightly thickened. 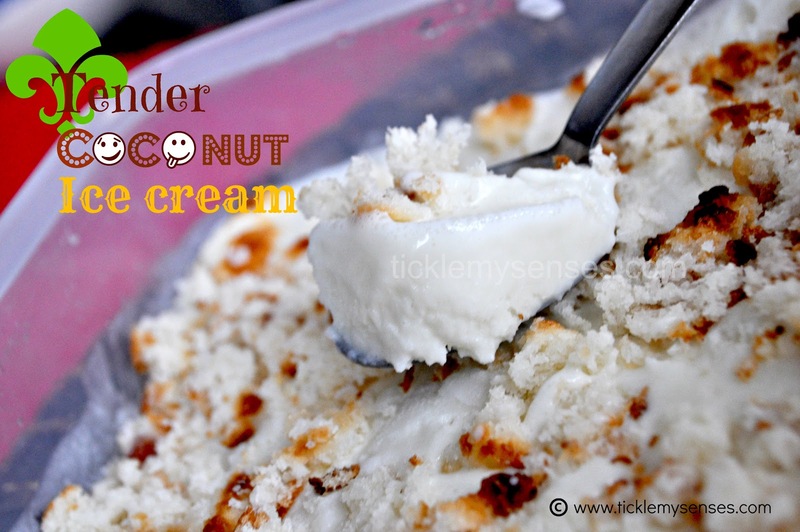 Take the icecream out from the freezer add the tender coconut pieces and gently mix to fold in the coconut bits. Add a couple of crumbled coconut biscuits to the top, lightly press, close and return the ice cream to the freezer for a further 3-4 hours or until set. I used the regular Condensed milk for this icecream. 1. For a vegan version of this Icecream you can buy Vegan Condensed Milk online here. Or make your own homemade lactose free condensed milk. 2. More interesting information on health benefits of coconut milk here. Thanks for stopping by and a warm welcome. You are right, the regular condensed milk available in most stores cannot be classified as Vegan. However the Vegan version made from Soy Milk can be effectively substituted to get an equally delicious Icecream. Post has been updated to include this information. Thankyou for your comment. I hope you do try this Icecream. I look forward to your feedback. I'm a little confused as to the quantities...by 1 tin of coconut milk you mean 394ml?...as in, equal quantities of condensed milk and coconut milk are to be used?